Researchers and clinicians working in the area of stuttering recognize that the cause of stuttering is complex. Over the years, many different explanatory models of stuttering causation have been proposed. One of the most persistent themes in several of these models has been that stuttering may be related to abnormal brain processes involved in speaking. As early as 1928, Samuel Orton and Lee Travis offered a neurophysiological model of stuttering. They speculated that stuttering resulted from incomplete development of hemispheric dominance. Although the early model proposed by Orton and Travis was ultimately not supported experimentally, the idea that atypical brain processing for speech somehow plays a role in stuttering has received ongoing attention over the years. Interestingly, even without a clear explanation of the definite causes of stuttering, our leading clinicians have made remarkable strides in developing effective courses of treatment for stuttering over the last quarter of a century. Today, the person who stutters can hope to achieve much in therapy, both in terms of cognitive as well as behavioral changes. It has been an exciting time for all of us involved in understanding stuttering and its treatment. In fact, we have been trying to bring our scientific efforts to the clinic, to better explain the changes that can be achieved during and following treatment for stuttering, and to more fully understand our treatment techniques and develop even more effective programs as we uncover some of the roots of stuttering. In our most current research, we have been attempting to shed more light on brain activity patterns in people who stutter as they undergo intensive, behavioral treatment. We have been using positron emission tomography (PET scanning) to compare brain activity patterns in stuttering and non-stuttering adults, and to track changes in brain activity as stuttering individuals complete a course of speech therapy. PET scanning represents a functional neuroimaging technique whose merit in studying the dynamic nature of the human nervous system has been recognized and applied widely by neuroscientists. It allows researchers to measure bloodflow and other physiological changes in the brain that occur either spontaneously or when subjects are engaged in performing a specific task. Functional imaging studies in our laboratory in Toronto have provided evidence that adults who stutter demonstrate atypical activation patterns when performing speech tasks such as silent and oral reading of single word lists. One consistent finding has been that our untreated stuttering subjects show a definite bias toward increased right hemisphere processing compared to non-stuttering individuals. Moreover, our stuttering subjects demonstrated overall higher levels of activation in both hemispheres, compared to our non-stuttering control subjects. We have speculated that this overall greater activity could potentially reflect the way that the stuttering subjects process speech, with greater monitoring and scanning. It appears that speech is a more effortful, less automatic process in our stuttering subjects. Following an intensive course of behavioral treatment, our stuttering participants were scanned again. The overall pattern of activation remained high and even increased, once again possibly reflecting higher demands in terms of speech monitoring and control. At this point, the stuttering individuals were engaged in conscious usage and monitoring of fluency skills, resulting in another form of effortful, although more fluent speech. We followed our subjects for a twelve-month period as they completed a maintenance program and then scanned them again. 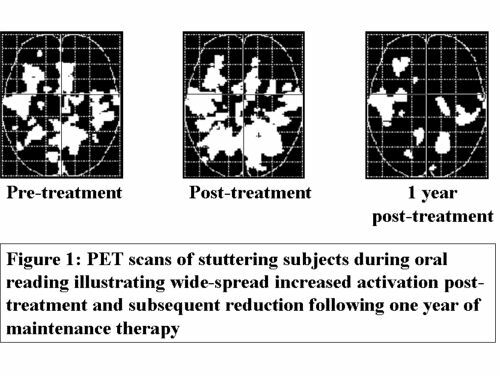 One year following their initial treatment, overall levels of observed activation observed in the PET scans decreased dramatically (See Figure 1). We have interpreted this finding as reflecting increased automaticity in speech processing as a result of a full year of rigorous practice of the fluency skills. Thus, one of our laboratory findings appears to confirm the message that is given in behavioral treatment programs for stuttering. Stuttering is often accompanied by force and effort. Intensive treatment using behavioral techniques, lessons the force, but still requires effort to consistently monitor the fluency skills. Successful maintenance (meaning continuous practice for a period of time) reinforces these skills and will often yield a less effortful, more automatic speech pattern. Our studies also detected differences between the stuttering and non-stuttering subjects even during the silent reading tasks. In addition to other differences, stuttering participants showed relatively greater activation in the anterior cingulate cortex during the silent reading tasks. The anterior cingulate is located in the medial wall of the cortex and is part of the limbic system. One of its functions is to serve as a bridge between the limbic system with the frontal cortex. It is thought to be involved with anticipatory reactions and response preparation to complex tasks. Clinically, we know that many adults who stutter have strong tendencies to scan the phonetic or orthographic structure of words for signs of potential fluency problems, even during tasks not requiring overt speech. Therefore, we have speculated that the increased anterior cingulate activation observed in our stuttering group may reflect heightened anticipatory reactions during the reading task. In addition, and possibly related to this anticipatory response, the anterior cingulate activation in our stuttering subjects may point to some form of silent articulatory rehearsal of the words, since this area is thought by some to be part of an inner articulatory loop, which becomes activated especially during less automated tasks. We targeted the region of the anterior cingulate cortex in a series of studies using silent reading both immediately post-treatment and again at the one year follow-up time. Post-treatment, our stuttering subjects showed significantly decreased activation in the anterior cingulate region during silent reading. It should be noted that during these post-treatment scans, subjects were asked to engage in the cognitive activity of employing their learned fluency skills. That is, they were instructed to think about using their newly acquired techniques even as they were reading silently. We interpreted these findings as suggesting that our group of subjects were no longer scanning and anticipating or predicting troublesome words, but rather refocusing their mental energy on using fluency facilitating skills that were taught in therapy. When we examined these same individuals twelve months later, we observed an even further reduction in anterior cingulate activation, providing further evidence that our group of subjects was successful in eliminating a great deal of the negative scanning behavior so often seen in persons who stutter. We can now say with increasing confidence that, based on our work and that of others, adults who stutter demonstrate atypical brain activation patterns when speaking, thereby strengthening the case for the neural basis of stuttering. Moreover, we believe that both innate and acquired brain processes need to be considered when discussing the neural basis of stuttering. We say this based on our current findings of brain activity patterns of stuttering before and after treatment. Some of the atypical patterns such as increased right hemisphere activity are observed even following treatment and when our subjects are producing fluent speech. To us, this suggests that such activation might reflect the presence of neural processes that are relatively stable and possibly congenital, in people who stutter. On the other hand, certain activation patterns, like the ones observed in the anterior cingulate region, do show definite changes from pre-treatment to post-treatment to follow-up time. We interpret our findings to suggest that this acquired scanning behavior is replaced by more positive mental sets following treatment. In summary, we believe that current functional neuroimaging techniques such as those that have been used in our studies, will help us to focus more intensely on neural control processes underlying stuttering and in doing so contribute significantly to our understanding of the disorder and its treatment. As of now, all indicators for treatment point to the need to adopt a multidimensional approach to treatment focusing on speech motor behavior as well as cognitive, psychological and other thought processes. Our research group (Robert Kroll, Stuttering Centre, Speech Foundation of Ontario, University of Toronto; Luc De Nil, Department of Speech Language Pathology, University of Toronto and the Toronto Western Research Institute; and Sylvain Houle, PET Centre, Centre for Addiction and Mental Health, University of Toronto) is one of only a few teams in North America who are actively engaging in neuroimaging research in stuttering. We are grateful to the Medical Research Council of Canada and the Natural Sciences and Engineering Research Council of Canada for their support of this groundbreaking project.